Marambra: [weeping] If I close my eyes then the thoughts start. They make me scared. I called you. I called you many times. I can't give the children what they need. I'm so sorry I was cruel to Mateo. I'm doing what I can to survive. I really want to be faithful to you, but I also like to have some fun... like a whore. Uxbal: Don't say that, Marambra. Forgive me. I've never known what I should give you; I still don't know. Something... I've never known. But we have hurt each other so much. Courtesy of Universal Music Mexico S.A. De C.V.
Publishing Warner Chappell Music Mexico S.A. De C.V.
Ordinarily I like these kinds of films about people struggling to overcome the odds of a bad deal.But in this film, Uxbal, the protagonist, has to struggle against every bad thing can ever happen to a person and all in a very short window of time. Death would be a welcome relief. 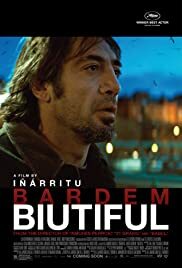 Javier Bardem plays his role extremely well though; I felt his anguish over his children and the immigrants he "managed." His story gets weighed down, unfortunately, by the number of tragedies he must endure and the tasks he must execute. 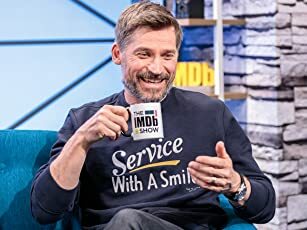 The director could have eliminated/edited a few of the off-point character traits and side stories to streamline the story for impact, which would have helped the film deliver more of a meaningful punch, not less. In addition, the summary of this movie says Uxbal must suffer a number of tragedies on the way to redemption. I'm not sure there is any redemption here. 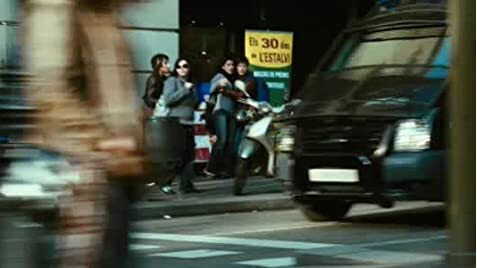 In Children of Men, the protagonist endures a lot and struggles through his own character defects to protect an black female fugee whose pregnancy provides hope for the human race. We feel joyful at the end of CofM because he has accomplished his task despite the odds. The ending of Biutiful, however, lacks a clear meaning and we're unsure of everyone's fate except for Uxbal's. The experience was depressing. I gave the movie an 8 because it was beautifully produced and well acted; the story was original, an uncommon view of Barcelona and the immigrants who go there for work under terrible conditions. But I doubt if anyone would want to see this film more than once. 40 of 60 people found this review helpful. Was this review helpful to you?